The success of the Farm Shop is built on the incredible hard work of our team butchers, chefs, servers and horticulturalists, some of whom have worked here on the Estate since the days when the Farm Shop was nothing more than a shed in a Pick-Your-Own field. This is our team. Farm Shop owners Charlie and Caroline Gladstone Charlie Gladstone have spent the last 25 years running a number of small businesses. They have learned a lot along the way and these businesses -including the Farm Shop- now employ around 100 people. The Gladstones are co-founders of The Good Life Experience festival, founded vintage homewares brand Pedlars, are owners of The Glynne Arms and are co-authors of The Pedlars Guide to The Great Outdoors. They are also farmers. They have six children and six dogs. General Manager of both the Farm Shop and The Glynne Arms, Alan Downes is a busy man. He joined the Farm Shop in 2007, when the site was a few stakes in the ground and little more than a vision. Alan started out as a trainee butcher at 14 years old before working for several supermarket giants, so from time to time he be found rolling up his sleeves and getting in on the action behind our butchery counter. One of our Farm Shop managers, Sarah has been with us for coming up to 8 years now and we can't imagine life without her; in a word, she's brilliant. Lorna looks after the deli and butchery areas at the Farm Shop, and has been here since the very beginning. At The Good Life Experience she organises all the ingredients for our campfire chefs, making sure everyone has what they need, which takes a LOT of planning. Relatively new to our butchery team, Simon has been with us for a year and a half, but he brings a wealth of experience to the team. He is passionate about sourcing good, local produce and loves the great team spirit here at the Farm Shop. Peter has been a butcher for 56 years and for the last 20 years or so has been going to India every year on holiday where he hires a Royal Enfield motorbike and travels with his wife Jan. He loves trying all the different dishes. Colette is a longstanding member of our expert team of butchers. She's been with us for over 12 years and her favourite part of the job is meeting new people and chatting with our customers. Vicky works on our Farm Shop outdoor events, from tree climbing to archery. She is also our Good Life Experience Site Manager. The list of Vicky's Good Life Experience responsibilities is long and includes all site logistics from tents to lighting, layout, loos, car-parking, vendor and craftpeople liason and lots more. Vicky lives on the Estate, so she has a short walk to work, sometimes on foot if there is snow on the roads, and in the summer you can spot her on her bike - the clipboard in her basket is the giveaway. 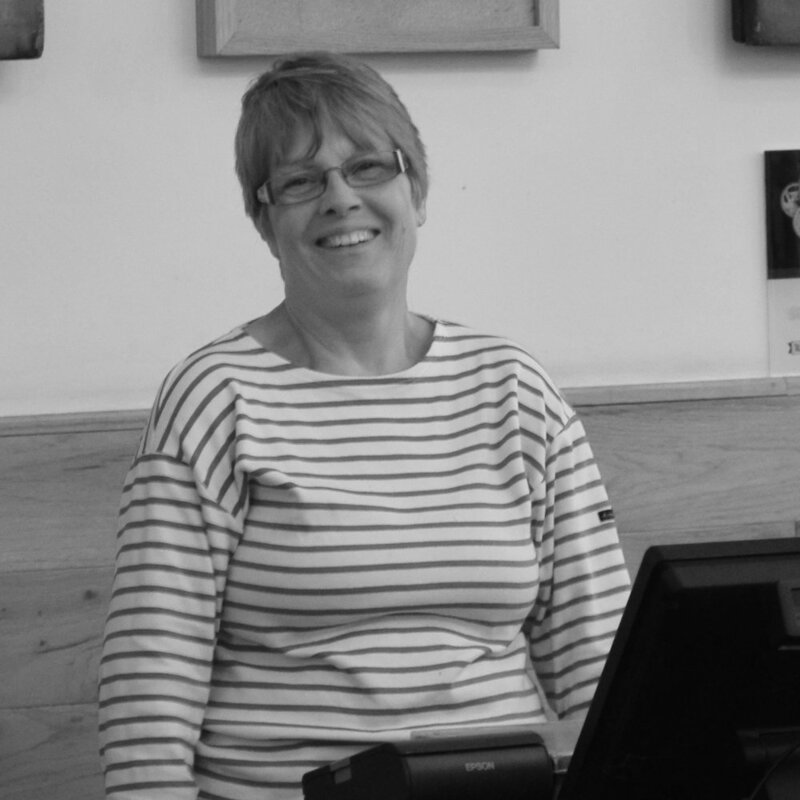 Glenys has been a loyal member of the Farm Shop team for 19 years now (yes 19!). You'll find her at the tills and can ask her all about PYO in the early days. Estate horticulturalist Joel is the man responsible for ALL those Farm Shop pumpkins. Such is his dedication that he fills his house with seedlings, keeping them warm through the winter, ready to plant out in the Spring. Sophie is our head of marketing. She works across all our Hawarden businesses and keeps you up to date with what's going on at the Farm Shop via the website, newsletter, social media and more. Tom runs the Pedlars Vintage Marketplace, and is responsible for finding all the best and most exciting Vintage dealers in the country. In his spare time he works on our Farm Shop social media. If you follow us on Instagram, that's Tom posting, so say hello! Tom is a keen fan of craft beer, and can often be found at the back of the Food Hall inspecting our latest arrivals from local breweries. Fab works in our marketing team as our graphic designer across Pedlars, the Farm Shop and The Glynne Arms, but she has many more strings to her bow. She is a fantastic photographer, a talented illustrator, and she writes code too. She also has an impressive collection of enamel pins.